With all the sensationalism one would expect from tabloids, there have been allegations made that the Mary Burke's job plan included plagiarized sections from the economic plans of other Democratic candidates from around the country. Immediately following this breaking news was more breaking news that the consultant hired by Team Burke, Eric Schnurer, was the author of said passages that were supposedly plagiarized. In other words, the accusations became that Schnurer robbed his own intellectual property. The American Political Science Association (APSA) published a code of ethics that describes plagiarism as "...deliberate appropriation of the works of others represented as one's own." It does not make any reference to self-plagiarism. It does say that when a thesis or dissertation is published "in whole or in part", the author is "not ordinarily under an ethical obligation to acknowledge its origins." The worst that Burke could be accused of is hiring a lazy consultant who didn't rephrase his own work for her campaign. Questions regarding some of Burke's hires have been raised before. Regardless, the Burke campaign chose to end their relationship with Schnurer. 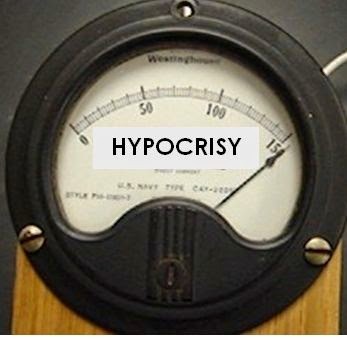 The reaction from Scott Walker and his Teapublican allies have been mind-boggling in their falseness and hypocrisy. State Senators Luther Olsen, Alberta Darling and Leah Vukmir have called for Burke to drop out of the gubernatorial race because of these faux accusations. That certainly takes some gall, considering that a bulk of the legislation that they "drafted" and passed came directly from ALEC, verbatim. That fact is why Vukmir fought tooth and nail to stop a Freedom of Information Act lawsuit from proceeding. And if the source of many of the bills they "wrote" wasn't originally written by ALEC, it was written by big money special interests, like Gogebic Taconite or Chris Abele. Would someone please remind me when Walker dealt with the controversy of Walkergate? When he "fessed up" to what actually happened in the county executive's office? Or the governor's office? I'm sure glad that none of us were holding our breaths for him to come clean on that. After all, the million plus dollars he spent on legal fees was just for compliance reasons, right? I need to also point out that this is coming from the same man that claimed that he didn't know what was going on a mere 20 feet from his own desk while Milwaukee County executive, even though his name is all over the emails, both as a recipient and a sender. People might call me a radical for this, but I think the fact that Walker and his allies stole our democracy and our rights are much more serious concerns than some schmuck too lazy to paraphrase his own work. Burke should have just laughed this off, and made any one of the points you make above. Firing the consultant just lends a measure of credibility to those making a big stink about this, and gives this non-story a second trip thru the news cycle with the firing. The audit didn't seem to get nearly as much airtime as this ginned up plagiarism non-story... and it shows a garbage fire of incompetence going on at WEDC. Loads of undocumented/unauthorized expenses, inconsistent accounting, the loan portfolio not being reconciled against the accounting system(! ), $77k in merit awards, lack of written procedures, failure to properly assess risk (looking only at total amount past due rather than total outstanding balance), employee turnover problems... and a bunch of loans either written-off of granted deferments. Worth a read! No kidding on WEDC. The next STUNNER story Bice breaks on WEDC will be his first. It's almost like the Journal-Sentinel corporate heads are telling him not to do it. We are well past time for an "accountability and balance in media" rally across from Fourth and State. In today's MJS there's a big banner headline at the top of section B (Local) "BURKE BLASTED FOR JOBS PLAN PASSAGES." Buried at the end of the article it notes that the passages in question are about 10 paragraphs of a 48pg document. Meanwhile, not even a peep about WEDC in today's MJS. Bice is a hack and anyone that holds him up as a watchdog is either an idiot or a repug laughin' all the way to the polls. Funny how a few relatively honest posts about a little of scott walker's corruption and criminality makes some cheer for the biggest propaganda shill. Last fall, he wrote a bogus piece that stated anyone signing a recall petition had no credibility telling the truth about walker. jake -- you should know better than to think it is his bosses holding him back. This is the guy that lied about walker's church and speaking in tongue. But then again, these holier-than-thou christians (and bice and walker a peas in a pod) don't ever believe in anything Jesus said anyhow. You are right on it, 1:12 AM. This has been a bad, embarrassing week for SKW & Co. And our media refuses to offer any insight into that. What with the unfair and unworkable Voter ID arrangement Walker has trumped up, the latest audit report on WEDC, the latest jobs creation stats, it all points to failure under his watch. What an awful joke this is when the media spoonfeeds the public that Walker says "People expect a leader that's going to take responsibility for their actions." All Walker does is project out on others that anything that doesn't work out for Wisconsin is someone else's fault -- he's always out of the loop that way. All of the "Bold" jobs plan variations SKW has presented have done very little to accomplish what they advertise. That is the real story during this election. Anon 3:51- Oh, you don't have to convince me about Bice's right-wing hackery. Notice that he almost always uses GOP sources and GOP framing in his articles? Combine that with the fact his degree is from fundie-laden Bryan College (motto: "Christ Above All"), and it's pretty clear as to where his loyalties lie. PS- Bice tweeted out today that he received the information on the story from....Scott Walker. And Bice ran with it from there. Strangely, I haven't seen Bice say anything about a complaint being filed with the DOJ asking open a bribery investigation against Walker due to the $700K laundered from Gogebic to Club for Growth. But he's had enough time to do 3 different articles on this non-story about Burke. A triumph for the school of lazy journalism! Seriously!?!? Hiring a consultant to share budgeting strategies that have worked in other states is frowned upon after fully engaging in alec "guerrilla" style legislation???? Wow, just wow. People, please vote these hugely unethical, double-standardly, total blowhards out of office! How much of Act 10 and Walker's other legislative triumphs were cut and pasted from ALEC documents? Great point. 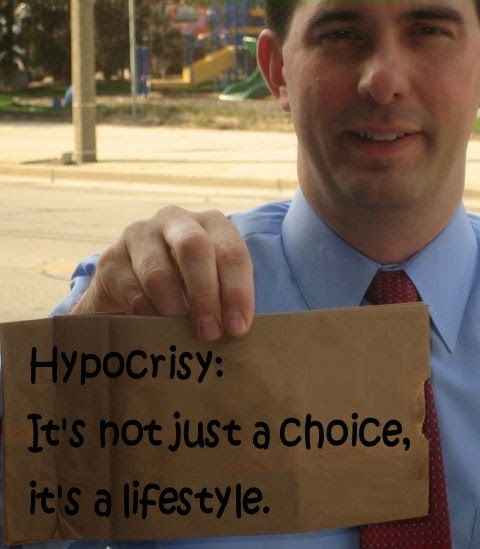 In all of Walker's ALEC recitations, there MUST be some that are copied from ALEC, aren't there? The hypocrite with the hypocritical brown bag. This entire column is based on a false premise. It has since been documented that Burke's jobs plan also copied from a White House press release and a Harvard report. And since this column was written, it has been documented portions of Burke's rural and veterans plans were copied from other sources. These aren't instances of "self-plagiarism". These are clear-cut examples of plagiarism. Period. Oh, you must be referring to the footnoted sections.